You would never describe the armoured-truck styling of the newly refreshed 2019 Mercedes-AMG G63 G-Wagen as subtle. Or suggest that its snarling 436kW twin-turbo V8 was lacking in power. Yet the tuning wizards at Brabus felt there was definitely a little wiggle-room for improvement. On both counts. The result: The head-turning Brabus 700 Widestar, unveiled at this month’s ground-zero of disposable income, the Monaco Yacht Show. Brabus 700 Widestar against the Monaco Harbour. Photo: Courtesy of Brabus. 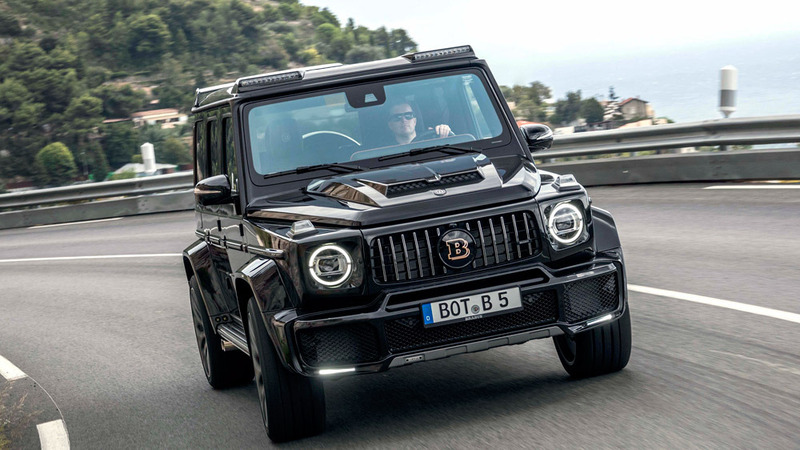 As the badging suggests, there’s now 700hp (522kW) available for performance pleasure, while the “Widestar” part reflects the additional 100mm of width grafted on to the G63’s already wide-beam body. The additional horses come courtesy of the same B40-700 upgrade Brabus offers to Mercedes-Benz E63 and S63 sedan owners. This clever plug-and-play engine control module re-jigs the mapping for fuel injection and ignition as well as increases boost to the dual turbos. In addition to the extra 86kW, the tuned V8’s peak torque soars from 850Nm to 950Nm. Brabus claims zero to 100km/h in 4.3 seconds. Photo: Courtesy of Brabus. What this extra abundance of power and torque delivers is a mild, though worthwhile, boost in off-the-line sprinting. Brabus quotes a zero-to-100km/h acceleration time of 4.3 seconds, compared to the stock G63’s time of 4.5 seconds. As with the regular G63, max speed is wisely limited to 240km/h. 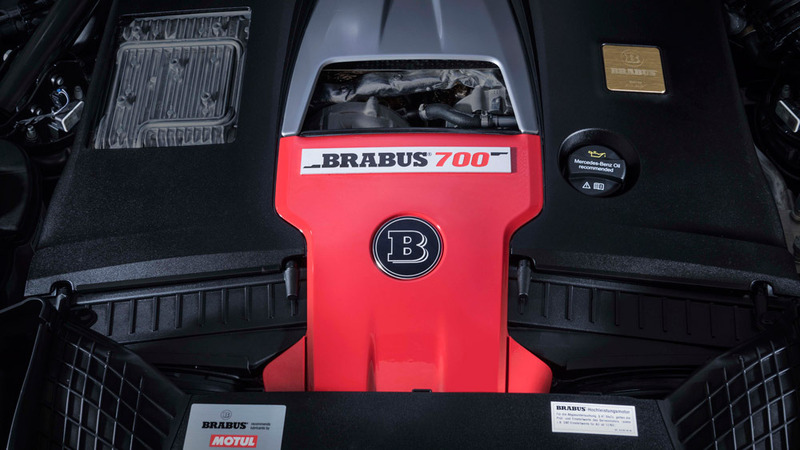 What this new Brabus 700 Widestar is really all about, however, is appearance. Those extra-wide, rally-style wheel-arch extensions are broad enough to cover Brabus-designed Monoblock Platinum Edition 23-inch forged alloys, shod with grippy 305/35-section rubber. Interior makeover shows surprising restraint. Photo: Courtesy of Brabus. Up front, there’s a new, bolder bumper design with a honeycomb grille and integrated wafer-thin LED lights. And to make sure onlookers are left in no doubt as to the G’s increased power, the bonnet features a towering power bulge complete with flared-nostril air intakes. Slower-moving traffic will also recognise the 700 Widestar’s performance credentials, courtesy of its roof-mounted lighting. Flash the move-over-to-pass highbeams and the vehicle in front gets a searing 24-LED blast of illumination. The tuned V-8 generates 950Nm torque. Photo: Courtesy of Brabus. At the rear, the performance styling continues with a new bumper, air vents incorporated in the rear arches, and a multi-layered rooftop spoiler. Subtle, it is not. 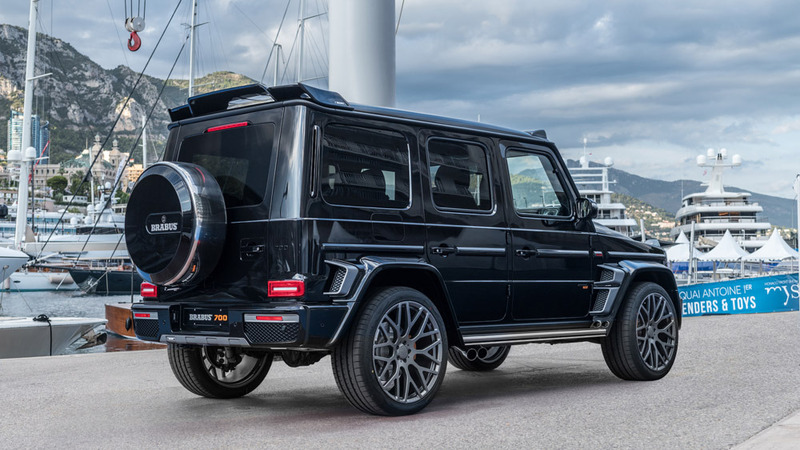 Talking of subtlety, or lack of, the 700 comes with a new sports exhaust system that takes the G63’s snap, crackle, and pop soundtrack to elevated new levels. Thankfully, Brabus has equipped it with a ‘Coming Home’ mode to ratchet-down the volume so as not to upset the neighbours.